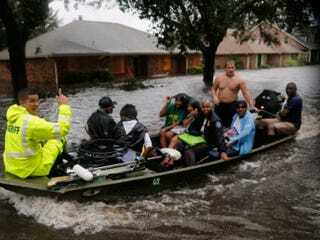 In a decision that makes federal funding available to state and local governments for emergency work in the stricken areas, President Obama has declared federal emergencies in the areas of Louisiana and Mississippi being hit hardest by Hurricane Isaac, the Associated Press reports. The orders he signed late Wednesday cover 35 parishes in Louisiana and 34 counties in Mississippi. While the New Orleans levee systems, strengthened after Hurricane Katrina devastated the area years ago, easily handled the storm, which passed slightly to the west of the city, other low-lying areas outside the federal system have reportedly not fared as well. Unfortunately, that's not been the case for low-lying areas outside the federal system, in particular lower Jefferson and Plaquemines parishes," said Louisiana Democratic US. Sen. Mary Landrieu. "Hurricane Isaac has reinforced for us once again just how vulnerable these critical areas are. We must re-engage the Corps of Engineers on this." Jerry Larpenter, sheriff in nearby Terrebonne Parish, said he thinks the storm's impact took many by surprise. "I think a lot of people were caught with their pants down," he said. "This storm was never predicted right since it entered the Gulf. It was supposed to go to Florida, Panama City, Biloxi, New Orleans. We hope it loses its punch once it comes in all the way." New Orleans' biggest problems seemed to be downed power lines, scattered tree limbs and minor flooding. One person was reported killed, compared with 1,800 deaths from Katrina in Louisiana and Mississippi. And police reported few problems with looting. New Orleans Mayor Mitch Landrieu ordered a dusk-to-dawn curfew. Read more from the Associated Press.